This picture was taken last July when we were discussing that the fescue eyebrows on some of the new bunkers were going to turn brown during the summer months. 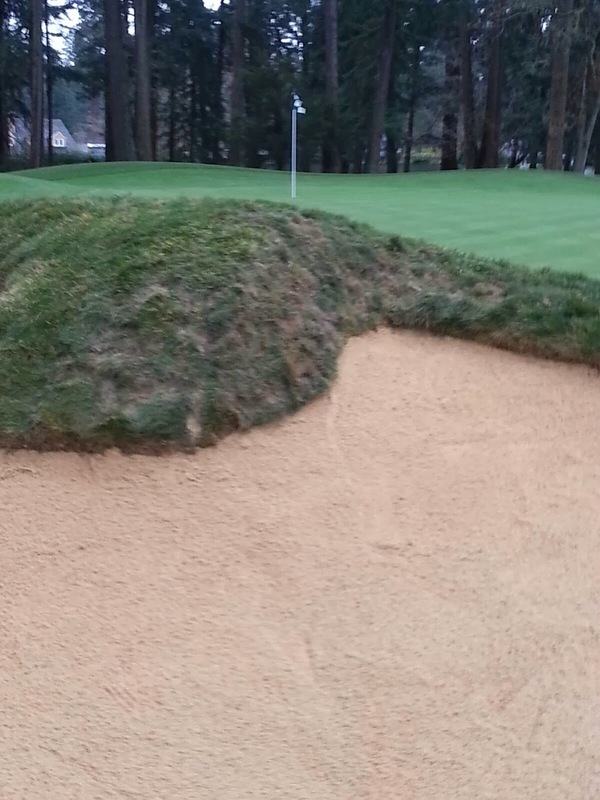 The picture below is that same bunker but this picture was taken just a few days ago. You can see that this year there is definitely a higher percentage of fescue that persisted through the hot summer months. You might recognize the next three pictures which I took last winter and posted on the blog. These pictures show our efforts to re sod some of the burned out eyebrows by using chunks of fescue sod taken from healthy areas. The repair job you see here was performed on that green side bunker left of #1. 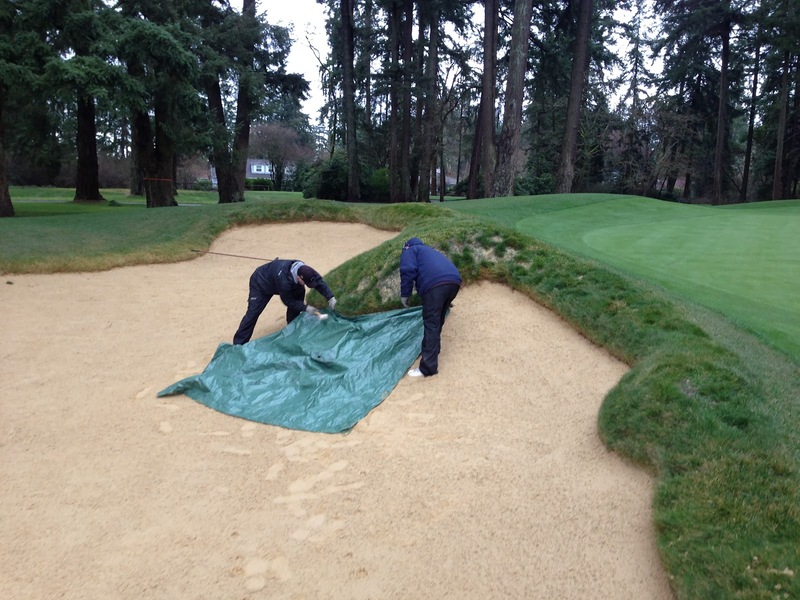 So the picture below is what that bunker looked like at the end of last summer before the fescue rescue process started. And now this next picture is how it looks as we near the end of this summer. Again, there is better survival of the fescue this summer in this area. Next you see Boo sitting on the bunker left of #3 green last summer. Now here's Boo sitting on that same bunker this summer. Certainly our fescue rescue efforts worked well here. This bunker eyebrow is looking great. Lastly, lets look at this last picture which is that green side bunker on #8. This picture was taken just a few days ago which was at the tail end of one of the nicest stretches of weather I've ever seen in Puget Sound. You can see that this bunker eyebrow is still causing us problems. It could be that the soils in this area are extremely gravelly compared to others but for the most part I think it's just that this bunker faces south and receives full sun all afternoon. Clearly we will need a little more intensive strategy here. Next year we will try more frequent wetting agent applications and maybe even fertilizing with a humus based product that will improve the water holding characteristics of the soil in this bunker face. We are up for the challenge. 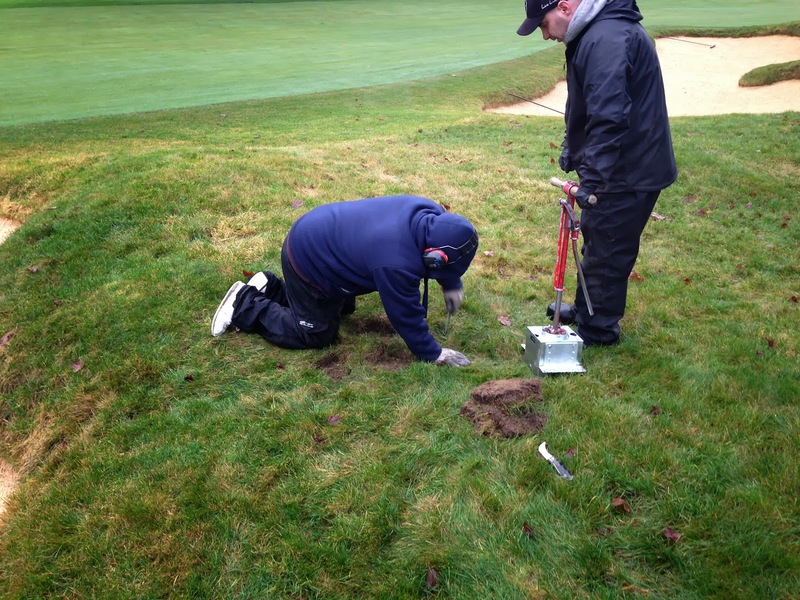 Tune in next year at this same time when we will again review the progress of our efforts to rescue the fescue.